With an aim to streamline the process for our international patients, we have designed a patient journey that allows to reduce the number of trips to Spain and the length of your stay. Our Programme is easy to follow and you will be guided through the whole process. Read further to get an overview of your fertility treatment journey with EVA Clinics. In Eva Clinics we will help you to organize your trip by solving all your doubts about the accommodation and transportation issues. We will provide you with the details about the closest hotels to the clinic and all the instructions about how to reach the clinic from the airport. 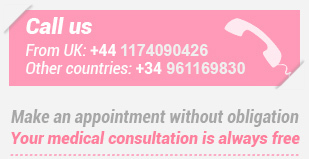 You can choose to contact us through different channels: by telephone, email, chat or skype which is an exclusive service for our international patients. Our Eva Clinics are experts in actively listening to the patients for understanding their opinions about the clinic because any suggestion which is made is taken into consideration to constantly improve our way of working. The Quality Assurance department is designed to fulfill this specific objective. All the international patients will be provided with a international assistant who will stand by their side along the entire treatment in order to offer them the necessary support and information. All our patients are the most important thing for us so we want to offer them all the facilities throughout the entire treatment. We rely on advantages and special discounts on hotels close to your EVA Clinic in Madrid Velázquez.